Baking your own treats at home not only saves money, but can be healthier for you. 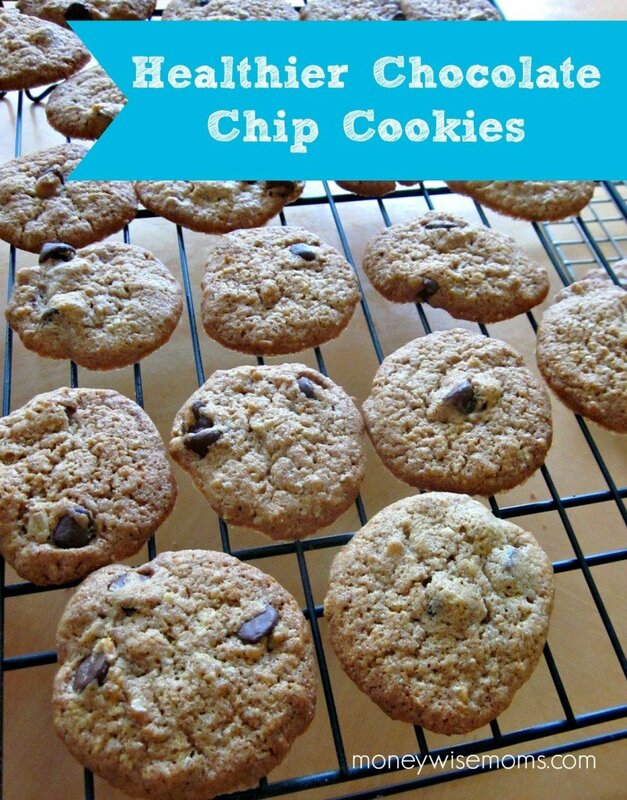 My kids love these Healthier Chocolate Chip Cookies! Instead of buying expensive processed treats, consider baking your own so you can control what’s in them. 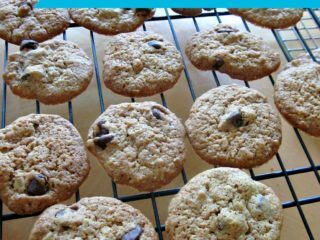 No preservatives or chemicals in this Healthier Chocolate Chip Cookies recipe! It’s healthier because there is fiber from the whole wheat flour and oatmeal. In addition, some of the butter is replaced with canola oil, making them lower fat. Finally, you only use half a bag of chocolate chips (to my husband’s lament). I usually bake a double batch and make them lunch-box sized (very small), then put them in freezer bags to take out during busy weeks when there’s no time to bake. Whether I do a double- or quadruple-batch of baking, I use my Wilton 3-Tier Cooling Rack Set. They’re such a space saver! I can stack them on the counter or kitchen table and still have plenty of room to work. I use a small scoop to portion out my cookies. Then they’re small enough to fit in our Easy Lunchboxes, which my kids pack every day for school. Grind oats in blender or food processor (I have a single serving smoothie blender and just pulsed a few times). Pour into a bowl along with flour, baking soda and salt. Beat butter in a separate bowl with an electric mixer until fluffy. Add oil, sugars, egg and vanilla; beat until smooth and creamy. With the mixer, add in the dry ingredients, beating on low speed until just combined. Bake cookies until firm around the edges and golden on top, about 15 minutes (since I made my cookies so small, they were done much sooner). Cool for 2 minutes before moving them to wire racks to cool completely. Healthier Chocolate Chip Cookies is linked up to Tasty Tuesday at Balancing Beauty & Bedlam. I know–the best thing would be to skip them altogether, but we allow for little treats here and there. I find all of the processed vs. saturated vs. otherthingsbadforyou so hard to follow. Seems like everything is bad in some way! Thanks for this suggestion! I don’t have anyone in school until next year, but I’m already gathering lunch ideas, and will include this. I’m sending this recipe to my sister, a newly wed; her husband enjoys sweets and this one will give him an additional benefit…fiber! Thanks!